With the Andes Mountains to the west and a long coastline in the east, Argentina is a land of spectacular waterfalls. They are present along the northern border in the tropical jungles of the north and in the subarctic hills of the south. The eighth largest country in the world, Argentina boasts some of the most beautiful, unspoiled landscapes to be found anywhere. The largest and best known of Argentina’s waterfalls, the Iguazu Falls are located at the northern most area of the country where it borders Brazil. This enormous falls is 3 kilometers across and actually has over 275 separate waterfalls which comprise the whole. 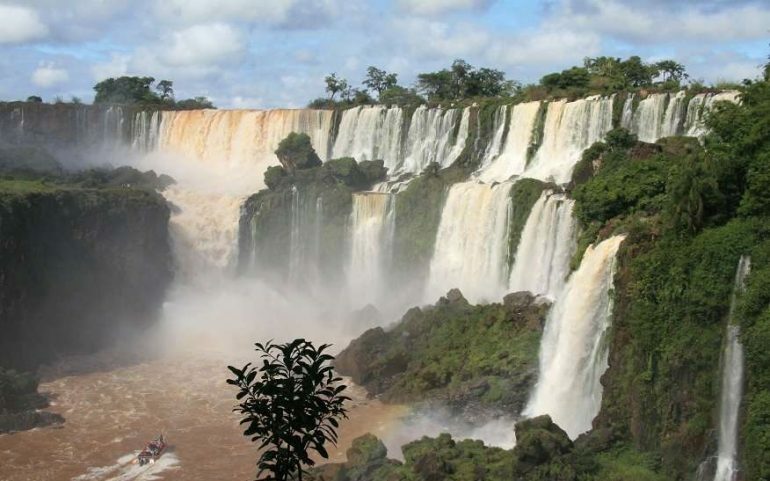 The falls is split by Argentina and Brazil and has catwalks placed along both sides for viewing. Visitors should be prepared to get wet because the volume of water cascading over the falls creates a sometimes dense mist. Helicopter and boat tours are available. Located in the Patagonian region of Argentina, El Chorrillo Del Salto is a delightful waterfall about 20 meters high. It is fed by melting snow and glaciers from Fitz Roy Massif and is most impressive in the spring months of September and October. The morning sun shines directly on the falls creating shadows which can make photography problematic and afternoon presents the best opportunities for pictures. The falls is close to the town of El Chalten and is easily accessible to visitors. Although actually considered a part of the larger Iguazu Falls, the Salto Arrechea is a little over an hour hike from the main falls. It is more secluded than the main falls and swimming is permitted. The Salto Arrechea is 30 meters tall and surrounded by lush subtropical rain forest where it is possible to observe local wildlife. The hike is pleasant and easy for those who are reasonably physically fit. Seen on the difficult Laguna de Los Tres hike, the Fitz Roy cascades are not a true water fall but a series of seasonal cascades which flow down the face of the mountain. A beautiful lacy vista is created during the summer months of December and January when melting ice and snow create a delicate pattern of flowing water along the mountainside. There are many other waterfalls and cascades in Argentina that are less well known than those named here. In the southern subarctic area of the country, the falls may only be visible in the summer months when ice and snow melts and flows down mountainsides. Visitors to Argentina with an interest in waterfalls should ask local residents if there is a falls in the area they are visiting.